PAYsure is the component of EFTsure that matches Payee Names with BSB and Account Numbers, something that banks don’t do. This ensures that the party you intend to pay, actually receives it. 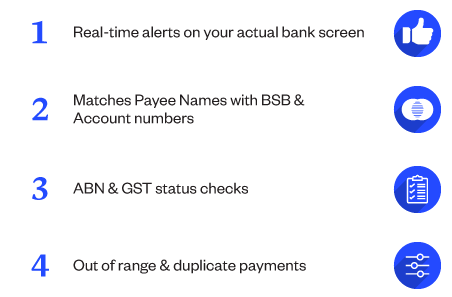 It does this in real time, alerts you to anomalies, and reduces the risk of fraud and error prior to your bank releasing your funds for payment. It also warns against out of range payments and duplicate payments. ABA payment ﬁles are text ﬁles and are therefore editable, exposing your business to the risk of fraud - alongside this, PAYsure oﬀers GST and ABN status checks on parties that payments are made to. Cybercrime and Business Email Compromise is a major fraud issue and is a huge risk for CEOs, CFOs, Directors and payment authorizing officers. EFTsure assists in preventing this.